Genoa Keawe has been an entertainer for more than 60 years, a recording artist for more than 50, and has received just about every honor and accolade that Hawaii and the Hawaiian music industry can bestow. Yet, just a few days short of her 82nd birthday, Keawe -- "Aunty Genoa" to thousands of friends and fans -- doesn't take her "living legend" status for granted. She speaks with gratitude and appreciation of the hospitality she received last month in Washington, D.C., as a recipient of a National Heritage Fellowship from the National Endowment for the Arts. Being able to sing at a Sunday church service before coming home meant as much to her as the formal ceremony honoring her lifetime contribution to perpetuating Hawaiian music. "The hotel was very expensive but they allowed me to stay one more day so I could sing for my church," she said. "Every time I talk about it I usually cry because it was so touching," she said. Keawe has been a Thursday night hit at the Hawaiian Regent for more than five years and lends prestige to the hotel's Hawaiian music schedule. She performs traditional Hawaiian and hapa-haole songs and the program last week contained a wonder mix of classics. Tonight, the hotel celebrates Keawe's 82nd birthday. The annual event has become an October tradition, held the last Thursday of the month to be close to her Oct. 31 birthday. A special stage was set up last year in the lobby proper to accommodate the crowd and there was still an overflow. Tom Cross, director of food & beverage, has been able to add more tables and chairs this year, but is bracing for a capacity plus crowd again. Cross helped to develop the Hawaiian music format and was there when Keawe opened at the hotel (Ledward Ka'apana & Ikona, Nedward Ka'apana, George Kuo, Makana, Martin Pahinui and Steven Hall are among the artists who perform on other nights). But he attributes the success of the program to Keawe. "She's been consistent for so long and with such a high level of grace, and she shows that a hotel environment can be friendly for locals and visitors. 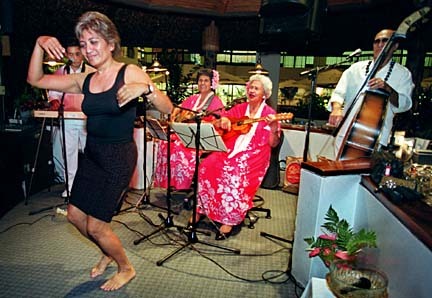 She brings in a good crowd and they'll jump up and sing and dance like the old style of Hawaiian entertainment. It's like a party." She offered a taste of what to expect in her performance last week. Song selections related in one way or another to Maui because she was going to be playing a benefit to help revitalize old Wailuku. Other songs were about Waikiki and the royal estates that once existed there. And of course she sang her longtime musical signature, "Alika," the song most requested by her fans. Adding their talents to the three-hour show were numerous guests who were called up to dance, sing or play with Keawe and her band: Gary Aiko (acoustic bass), Alan Akaka (steel guitar) and Momi Kahawaiola'a (guitar). The cavalcade of talent included island residents, expatriates from California and beyond, and Japan visitors Masao and Amy Opikake Kunoli. Akaka moved to the bass while Masao took over on steel and Amy sang several Hawaiian songs. "It was why we come here," Amy explained of the couple's second visit to Hawaii this year. 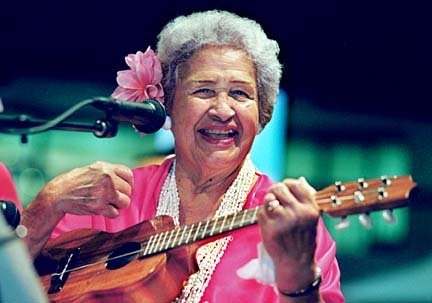 She and her husband were also recording a Hawaiian album during their stay and wanted the opportunity to sit in with Keawe, who welcomes all. "You give others a chance to sing because you cannot hog everything (and take) all the credit," she says of her willingness to share the stage. "Every place I go, people want to join in with me and sing because I play for enjoyment. We're all musicians and everybody's good in their own right. "I say to myself let them sing and show their best. Musicians, too, because if the musicians aren't backing you up, you got nothing." And so it was that when Keawe appeared as a special guest as Kawaikapu's Hewett's ho'ike in August she encouraged each of her backing singers to take over the lead for a verse as she sang "Alika." She is also known to give freely of her time and knowledge as a mentor to young singers. Brittney Anelaikalani Jennings, the 13-year-old falsetto singer who recently released her first album, describes Keawe as an inspiration as a singer and for aloha she conveys. "I think she lives the aloha spirit (and) I will never forget how supportive and helpful she has been to me from the first time I met her. "I was just someone who loved to sing. She didn't have to be nice to me but she was. I'll always remember that. " For Keawe, hosting the party tonight will be easy. "I love Hawaiian music so that's the story of my life." When: 5:30 to 8:30 p.m. Thursdays; she celebrates her 82nd birthday with a bash tonight.